Tim crossing the field of avalanche debris. 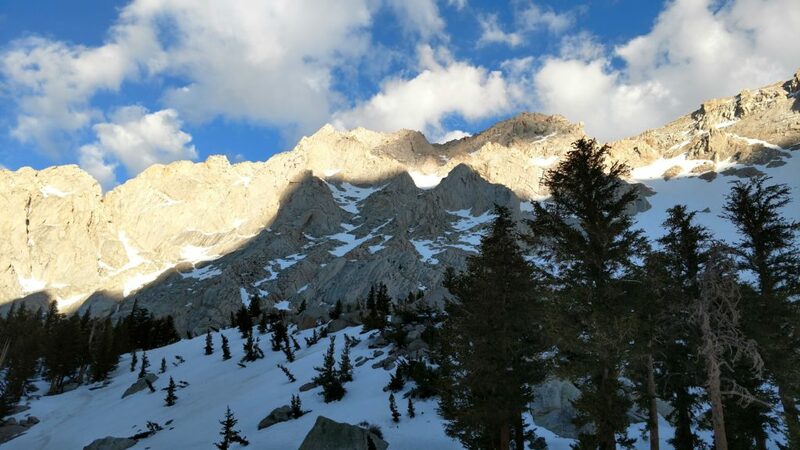 This post is the third part of a five part story about Mount Whitney. If you haven’t read the previous installments you can find them here. Andrew’s route led us up a deep snow bank. The incline started gradually, but grew steeper as we walked. Up we went, nearing a waterfall to our right. 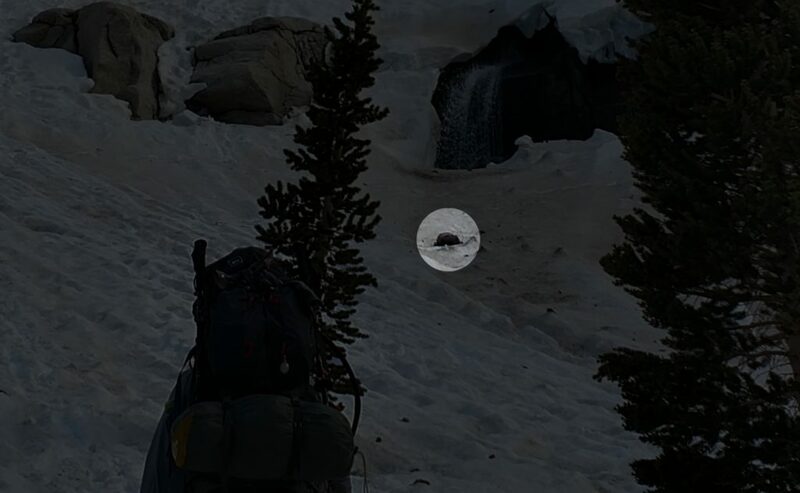 As we grew closer, we noticed something below it; a backpack. 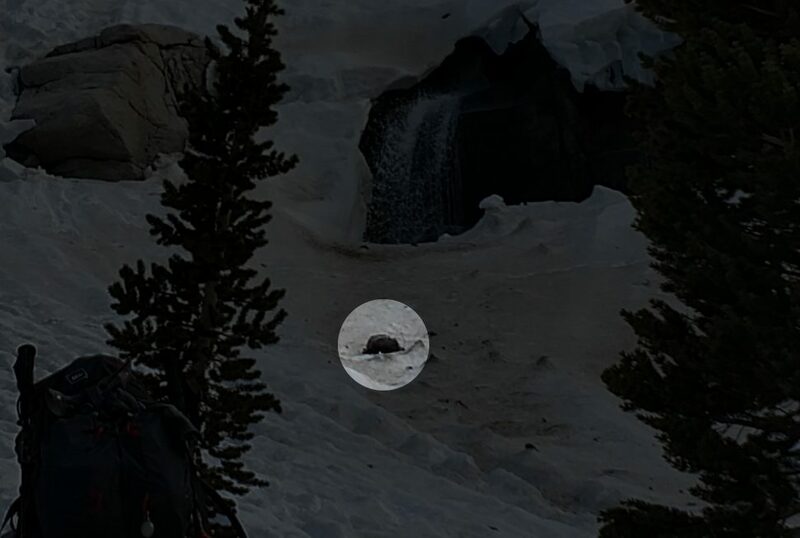 Here you can see the highlighted location of the backpack below the waterfall. “Do you think that’s the missing hiker’s pack,” Tim asked. I strained to remember the photo I had looked at before we set out on the trail. “I think it might be,” I said as I started to edge closer, careful not too slip. I knew the snow around the waterfall could be dangerous, and didn’t trust myself to get too close, given my inexperience. Andrew, however, had more confidence in his footing. He circled the bag, anchored himself with his ice axe, and opened the pack. He found no identification inside, but he did pull out snack packaging with Asian writing. We all felt pretty certain that, yes, this pack did belong to the lost hiker. We left the pack and pressed on, noting a disturbing sight as we circled wide to the left of the waterfall; footprints in the snow that stopped just above the fall, only to meet with an imprint that looked like something slid down over the falls. Did something fall in? Did Cindy fall in? I felt a chill run up and down my spine as these thoughts raced through my brain. Then I pushed them out and focused on the mountain in front of me. I felt safe, but I knew at the very core of my being that the perils of this place could emerge at any time. I shivered. The sun had sunk below the ridgeline, and the air temperature dropped almost instantly. I didn’t notice immediately as we fought our way up the snow. We expended a lot of effort, but made little progress. That seemed to be a recurring theme for the day. When the incline leveled off, I breathed a sigh of relief. Andrew lead us across this plateau, and right away we noticed that the snow got rougher, more uneven. Looking around, branches and debris stuck out everywhere. “Avalanche.” Andrew said. I shuddered as I looked around. We pressed on. Jon walked up as I replied to Tim. “I feel like I’ve got more to give.” I said. I looked back down behind us, then up ahead. Andrew still trudged slowly uphill, but the incline kept getting steeper. At one point, it looked almost vertical; it would almost be ice climbing at that point. As much as I wanted to summit Mount Whitney, I knew we were out of our depth. Tim was right; the time had come to pull the metaphorical ripcord and activate the bail out plan. I asked Jon what he thought, and he agreed. The three of us on the same page, we alerted Andrew to the fact that we were bailing, and offered to share our campsite with him. He acknowledged, but wanted to press on. So Tim, Jon, and I turned around and headed back down the side of the mountain. As we began making our way down the incline, I noticed how tired I had become. And hungry. And cold. I could tell Tim and Jon felt the same. I needed more water, to put on another layer, to sit and rest, and to get some calories in me. My body sent me all of these signals, but amidst them I noticed another as well. Something simply wasn’t quite right. The three of us stopped almost simultaneously. “Isn’t that waterfall right ahead of us?” Tim asked quietly. We tend to think of ourselves as relatively safe. It’s not that we think that accidents can’t happen, it’s just that we feel that they really only happen to other people. We believe that we are more attentive, more prepared. We’ve convinced ourselves that we make more rational, logical, pragmatic decisions. In general, we’re all mistaken about that. Hunger, thirst, exhaustion, and a desire to set up camp and get comfortable distracted us from the danger ahead. I got tunnel vision, and could have paid a big price for it. Luckily, Tim and I have had enough experiences in our lives that have led us to trust our guts, to listen to our intuition, and so these senses spoke to us: “Wait. Stop. Danger Ahead.” We were wise enough to listen. Many people in our position might not have. They wouldn’t fail to listen because of stupidity or foolishness, but rather because they underestimate the forces at work. It’s easy to think, “People do this as a day hike, how hard or dangerous could it be?” The answer is very. 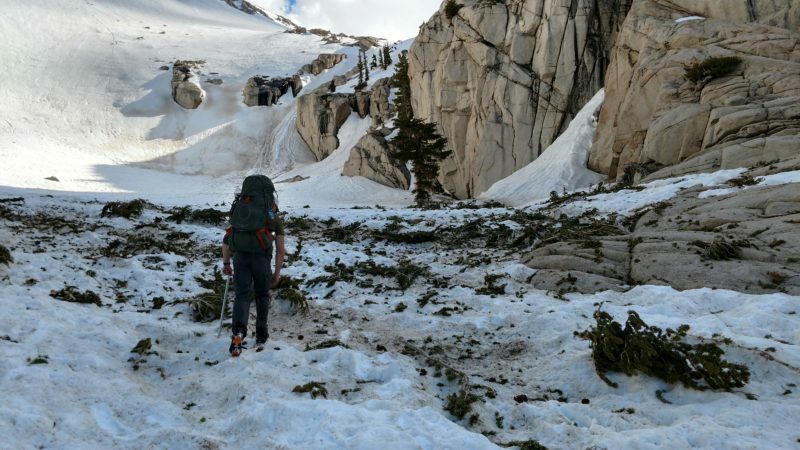 Sure, in the right conditions, an experienced hiker or athlete can summit and be off the mountain having beers in ten to twelve hours. But Mount Whitney has no impetus to maintain those conditions. The weather can and does change. Sometimes it might seem easy to summit, but make no mistake, there is no such thing as a beginner’s mountain. We swung wide around the waterfall, following the tracks that we made on our ascent. Descending, however, took even longer. Truth be told, I should have stopped much sooner for food and water, and I could feel it. I steeled my reserve and focused on getting down safely. Looking to my left at the waterfall that we had almost walked into, I noticed that Cindy’s backpack was no longer where we left it. “How strange,” I thought to myself, then shook it from my mind. I needed to avoid distractions for the moment. I needed to focus on keeping my footing steady. In my inexperience, I struggled to keep my balance. The weight of my pack encouraged me to lean over, and I actively tried to keep myself from pitching forward. In doing this, I swayed just a bit and slipped. I only slid a few feet and stopped. I planted my crampons and tried to hoist myself up but the snow gave way. In a split second I began to slide down the side of the mountain. I quickly gained speed as I skidded downward. Snow rushed up my back and beneath my pack as I tried to bury my ice axe into the snow behind me. The first blow glanced off the icy crust. Ten more feet flew past as I picked up more speed. I tried to roll to my right side and again struck at the snow with my axe. It caught but bounced out. Luckily, that slowed me enough that my next strike held fast. My shoulder ached from the jerking stop, but relief washed over me, and I started laughing almost manically. “Oh man, I almost pissed my pants!” I exclaimed between laughs when Tim asked if I was okay. I looked up at the track from my uncontrolled slide. Thirty feet. I had slid thirty feet before I could self-arrest. That’s a scary thought. Had I continued I probably wouldn’t have stopped until I careened into one of the rocks or trees below me. If I had caught one of my crampons on the ice, I could have wrecked my ankle. I held fast to the handle of my ice axe and took deep breaths to calm myself. I am confident that this ice axe I had been so certain I would not need, saved me from being carried off the side of that mountain with broken bones, or worse. “Had I slid like that above the waterfall, I would be dead right now!” My brain shouted at me. I pushed the thought out of my head as I kept taking slow deep breaths. As I held fast to my axe, taking slow meditative breaths to calm my nerves, the beauty of the snow, rock, and trees overtook me. The sound of the waterfall calmed me as the dwindling light twinkled on the ice I had dislodged in my slide. I breathed the cold air in deeply, and watched a small cloud escape my mouth as I exhaled. My heart rate slowed, and I righted myself. In the beauty of twilight I continued making my way down the side of the mountain. Mount Whitney had terrified me, but that made her no less beautiful in my eyes. Despite the scare, or perhaps even because of it, I couldn’t help but notice just how beautiful this place is. After my uncontrolled slide, I found myself thirty feet closer to our campsite. Still, it took us a long time to back track. Almost half an hour passed before the team rushed around on flat ground going about the necessary preparations for a night of camping. We put on extra layers, filtered water, pitched our tent, and gathered firewood. 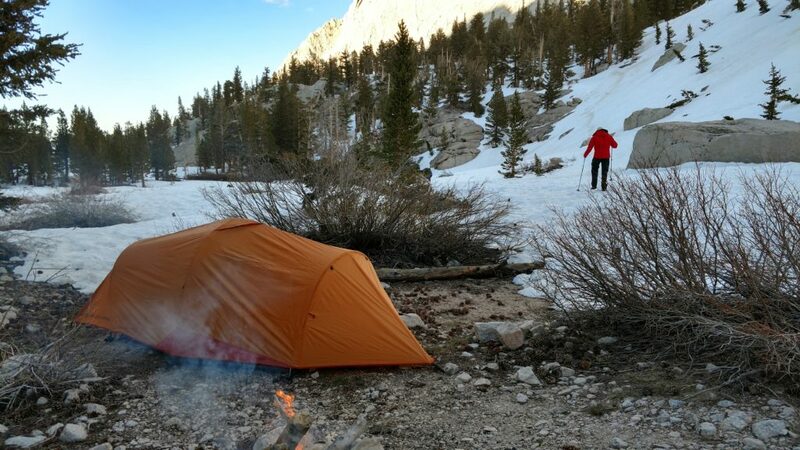 Luckily we had decided to bail at an advantageous spot, as fires aren’t permitted above 10,000 feet on Mount Whitney; we turned back at 10,413 feet, and our campsite sat right around 9,800. We gathered enough wood from the surrounding area that we could burn our fire all night if we kept it small. Not a bad place to spend the night, truth be told. We cleared the ground and pulled together a stone ring. Tim and Jon built a nice fire, then headed to where we had seen the couple earlier in the evening. They had set up about a quarter mile back from our current location, but we wanted to make sure they were okay and invite them to join us around our campfire. I sat down and meditated for a few minutes in their absence. Aside from the occasional pop from the pine wood in the fire, Mount Whitney was peaceful and quiet. This post is part of a five part series. You can find all the posts, once published, collected here.